My friend Liyanage Amarakeerthi, who is now reading for a doctoral degree in the University of Wisconsin, Madison, commenting on Sri Lankan literature, said that while the "celebrated" works of authors like Michael Ondaatjie, Shyam Selvadurai and Romesh Gunasekera are certainly praiseworthy, there are novelists in Sinhala (and probably Tamil too) who have written far more important and superior works of fiction. He lamented that the English Departments in our universities have produced hundreds of graduates but very few who are able to appreciate the nuance of language and idiom in Sinhala to a degree that can allow them to translate these into English. If such an exercise would excite their interest in the first place, of course. If globalisation implies a "global village" or a "global family" as is often advertised by those who are only interested in globalising poverty and food insecurity on the one hand and expropriating profit on the other, there has to be in place a mechanism that facilitates cultural cross-currents. What we have now is a system whereby we are all fast becoming Americans (of the worst kind, one could add). The tragedy then is that we do not possess the conduits (or do not have access to them or the skills to utilise them) through which our cultural sensibilities can be made available to our fellow creatures elsewhere in the world. We have had very few authors who were equally comfortable writing in English and Sinhala. Sarachchandra translated a couple of novels into English. Martin Wickramasinghe reserved his English writing to theoretical and philosophical essays. Gunadasa Amarasekera translated a couple of his short stories into English, I believe. Sarachchandra, probably until very late in his life, believed in universal tenets, whereas Wickramasinghes was an effort that sought (and attempted to develop) the "native". Amarasekera, after a brief flirtation with Marxism, perhaps more for its humanistic values than anything else, returned to an active engagement with foundational cultural soils. Mahagama Sekera obviously grew in the company of these authors and shared some of their concerns. He also had his own identity and left a mark in the literary scene that deserved better investigation. It cannot be that he is untranslatable. He remains untranslated. 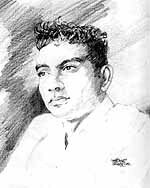 Mahagama Sekeras literary import is second to none among the Sinhala literary greats of the modern era. Sekeras creative energy was like a body of water swollen with the monsoon rains. He was a poet, a lyricist, a dramatist, an artist, a musician and a film maker. Convention could not entrap him and in form as well as subject his waters spilled over and ran in all directions. He was life-giving and life-affirming. As a people, we drank deep from the many wells that Sekera dug in his relentless search for humanity and its appropriate location in human matters. Sad to note, our digestive systems have been too poisoned to absorb him and we neglected taking corrective action. The vast territory of concerns that he embraced is perhaps what makes people from all points of the political spectrum consider Sekera to be a friend and comrade. This is why his death left a question mark that theoretically opens up the space for all kinds of investigations, all focusing on that necessarily elusive prize, the "Sekera Lakuna". It is in the journey and not necessarily the destination that we discover self and community, and thereby qualify to imagine futures. It is forgotten now that some of Sekeras songs have been banned. Among them, Me Sinhala Apage Ratai, which was branded as a chauvinistic song and even disowned by Nanda Malini. Short-sighted and small-minded are the terms that come to mind, for that song did contain the following line: sama karuna guna mahime, apa upathin lada urume. It is only in the context of "history" constructed by Eelam mythmakers and their adjuncts that Sekera and others like him get bastardised. I can think of no other historical blunder that can top this. After all, is this not the country of us Sinhala people? If not, is there any other cultural-geographical entity that we can call home? Sekera was essentially a humanist. His canvass was broad, which is why he could affirm the depiction of Samanala Kanda as the spiritual destination of all religious faiths. His depictions were sensitive. He dwelled on delicate, human things. In this vast universe, his sensibilities could speak of the Sinhala Rata without being chauvinistic. Sekera did not deny any community a place in this land. His vision, as evident in what I consider to be his great poetical work, "Prabuddha", was for collective enlightenment. He recognised the bodhisatva gunaya inherent in all of us. His heart was large enough for anyone to make it his/her permanent residency. I believe it is the closest we have to the much sought after "Sukhavathi" of the Buddha Amithabha, metaphorically speaking. Our hearts, we must admit, have been too narrow. For too long. Something we can all reflect upon on January 15th, Mahagama Sekeras twenty sixth death anniversary. And of course afterwards as well.